The DIY Bride: The beginning of my programs! The beginning of my programs! These are the supplies that I've been using to create the programs. 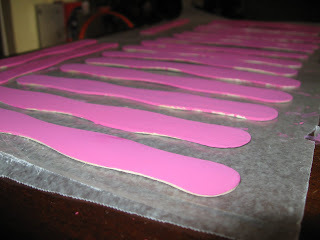 I wanted to spray paint the wooden sticks, but I found it nearly impossible to find my colors in spray paint. The closest I came to find tangerine and hot pink in spray paint was fluorescent spray paint, which I didn't care for. So I'm taking on the task of hand-painting each stick, front and back. I bought all of my materials at Hobby Lobby. You will want a nice large flat surface to work on. 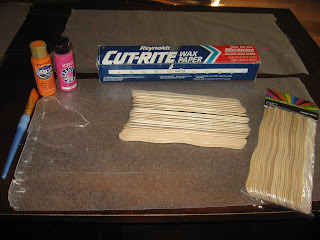 My fiance suggested using wax paper since the paint from the sticks won't stick to it as it is drying. 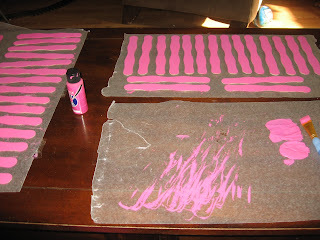 I've lined my area with wax paper (2 areas for drying and 1 area for painting). This can be time consuming if you plan to go the route that I am, but overall, if you have a day where you have nothing to do, these can be painted easily over a couple of hours. Here you can see how I utilized the areas on my flat surface. Aren't they fun!? As you can see, I still need to paint some more and fill in areas on the sides of the sticks. I can't wait to show everyone how they turn out once they're done! More to come later on once I'm finished painting! Looking good! I'm also making fan programs. Tissue Paper Pomanders - Check!